What are your LEGO building plans for the holidays? This Christmas I suggested to my wife, since we started building star wars sets together, that we create a huge winter village scene including a train for under the tree( I want numerous trains all at once). Amazingly she agreed. So the plan is to build all the winter village sets including all the small xmas specials along with having the emerald night(unless someone has a new holiday train to trade for) circling the tree. Anyone have some suggestions as to what else might go well with this endeavor? Make a bunch of ornaments or even garland for your tree using LEGO. 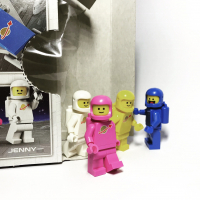 Minifigs can also make great ornaments. I don't have as much free time to build as I would like, so I resorted to building upon the modular series for my part of our LUG's annual holiday display. I added snow to every flat surface and icicles to many overhangs. I have all the Winter Village sets, so I intend to build them over the course of December, starting with the Toy Shop this weekend, the Bakery onthe weekend of the 7th/8th, the Post Office on the 14th/15th, Cottage on 21st/22nd, and the Market (plus this year's two small sets) on Christmas day :) Last year's small set will be built sometime in between. We're having to adapt for our current house and aren't sure what we're doing this year. However last year under our tree we had all of the winter village sets, adapted for 9V holiday train, MMV buildings, various advent calendar pieces, seasonally appropriate CMFs, MVR adapted into a nativity scene (including PoP camels and MOCed sheep), MOC train station, and my favorite - the Ninjago Ice Dragon in the lower branches of the tree menacing the village. We're having people over on Sunday specifically to build the winter sets, I hope the winter market arrives by then. I hope to MOC a church for the village during December but I'm slow and doubt it will be done in time. I should be able to MOC some ornaments though. @rocao-What are your streets made out of? I love the giant tree and skating pond. Very well done. Also, for more than a year, a #7644 MX-81 has been in my closet (the BEAST, as I've been informed), and I really really really can't wait to build it. But it's a reward/motivation for a little project of mine which I haven't finished yet, so it might have to wait. Sounds like a nice way to spread out the joy of building and Christmas decorating. Enjoy! @mressin-I just built the hive crawler a few days ago and have to say it is a decent build. I especially like the creative yet simplistic way the legs move. Galactic titan is a cool set. Very good playability. The main thing is that it just looks badass. Brick built roads. You're looking at the sides of the bricks as they lay flat on their side. I can email you the LDD file if you like. I see it now. I asked because it had a very shiny look to it. as to the file, sure. That's a lot of black to have created as large and long a road as you have there. kudos. My wife wants me to build "A Laketown Christmas" instead of the usual Xmas Village. @rocao Did you raise the level of the modulars to match the roads? I would like to have the road LDD file you are generously sharing. Your display makes me regret I took all my modulars apart to make room for the Winter Village sets. Next year! Like others, I plan on spreading out the WV builds in December. I want to make a large ski mountain for the Emerald Night train to travel through behind the village. But I have to finish the Golden Hall of Edoras first! Our dining room table is never used for meals because the room is just too small so the table becomes the display area for our winter village. 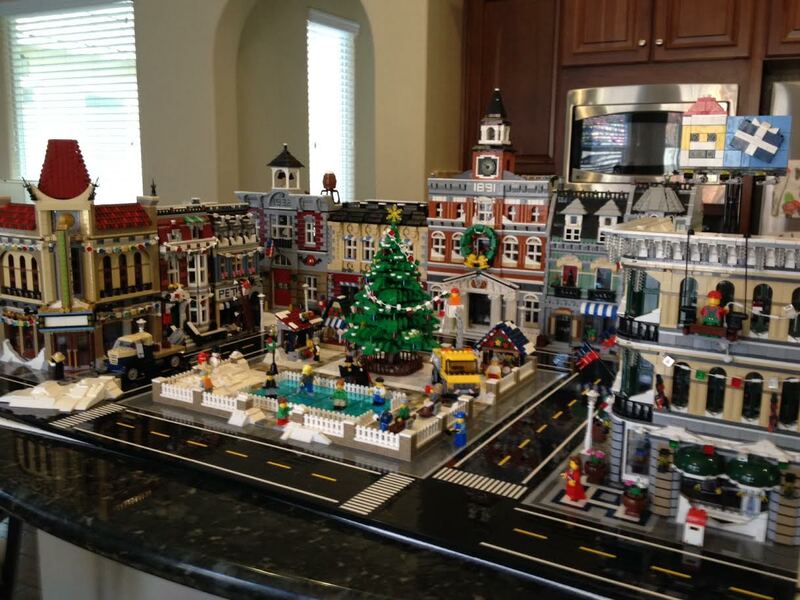 We also add the little builds from the City Advent calendar. We found clear plastic ornaments last year at Michael's Craft stores that have a good size neck opening and we put Lego pieces in them. We add the Lego ornaments, small builds, and Lego key chains. A small Lego train sits on the mantle along with a small forest of Christmas trees. Allow plenty of time to build the WV sets…none of them were quick builds for us. Glad we started in November because we just finished. We are hoping to build the Parisian Cafe (if we can get our hands on one) along with Sydney Opera House as a family over the holidays. And the Robie House with lots of extra black plates to support its flimsy base as well as Brandenburg, Farnsworth and Rockefeller Center. Would you post some pics of your LR train please. I'm thinking about 'holidayfying' one also if I can find one at a really good discount. My Lego buying has gotten out of control lately so I will have to wait for a really good sale, but if/when I find one, I'd like to be ready with some ideas on making it fit with the overall look of the WV. We are working on our winter sets. We currently working on the cottage. Then opening the Market. I think I want to add snow and make it look a little more staged. ^ @ktmo- I add snow. I know some purists might shudder at the thought of adding anything non-Lego to a display, but to each his (in my case, her) own! I use craft store type snow, mostly opaque, and then a gentle sprinkle of the clear iridescent type here and there for accents. This mix makes it look as natural as fake snow can look. ;) But it does add a very nice touch if you are not opposed to it. Good luck. Built the cottage last weekend, just picked up the market for this weekend leaving toy shop, post office and bakery for the next three weekends. Add a sprinkling of the winter freebies. After Christmas I'll be helping with HE, 41999, chi temple to name a few. I see a bad back in my future as my kids always build on the floor. Just started on the Winter Village sets today. Taking a different approach than years past and doing them modularly. I'm also debating bringing the set up to Bricks Cascade in March. I'm going to be building my lone (big) WV set today, the WV Bakery, for our Christmas display. Hooray for December 1st! Officially fun time holiday season! (minus exams, they're no fun). @rocao - Nice job! What is the building in between the Fire Brigade and Town Hall. To me, it stands out, even from behind the tree. I really like it. And until you said it, I didn't even realize the roads were bricks on their side. Not too bad at all! We'll be reassembling our Winter Village Toy Shop, Bakery, Post Office, and Cottage for Christmas, and swapping them in for stuff that's currently on display (mostly Star Wars at the moment). We also have a custom WV Chapel based on an entry to the Expand the WV contest a couple years back which goes nicely with the lot. I cannot wait to build my PS that I ordered during the 3x VIP sale. @Bosstone100 That's his modular library.